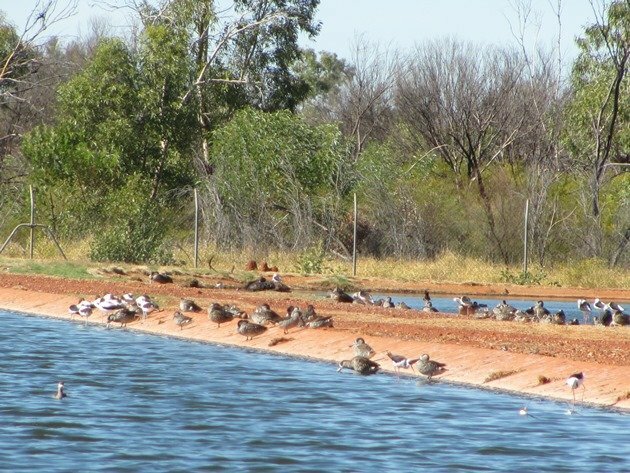 In Australia in the north of the country where the land is dry and there is very little water for much of the year one of the best places to find birds is at the town “Poo Ponds”, which is officially called the Waste Water Treatment Plant. 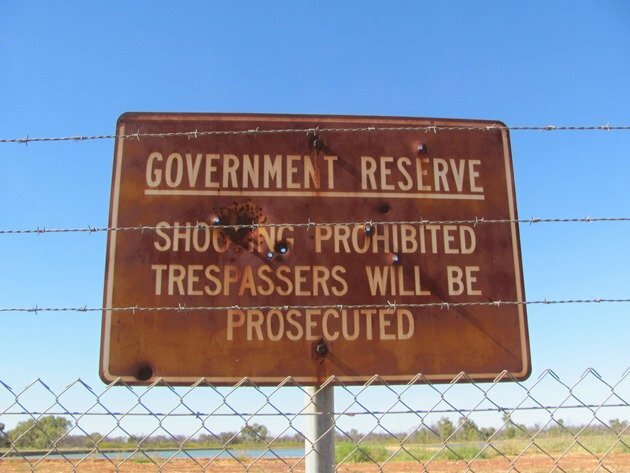 It is rarely sign posted as a tourist attraction, so we generally refer to Google Earth to look for large fresh water ponds close to the edge of town. 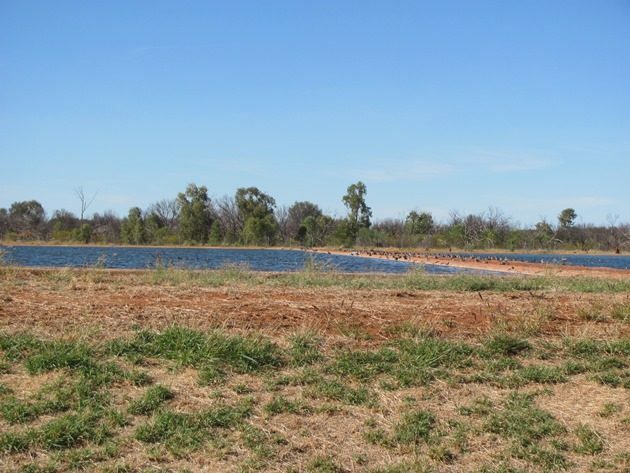 Whilst travelling in the Northern Territory earlier this year we paid a visit to the Tennant Creek Poo Ponds, which are situated on the south side of town via Fazeldeen Road. Arriving in town we were greeted by Galahs, Whistling Kites, Black Kites and Crested Pigeons and the first birds we observed at the Poo Ponds were Willie Wagtails and Magpie-larks. We soon noticed Black-winged Stilts and a lone Black Swan and a Sacred Kingfisher landed on the fence. 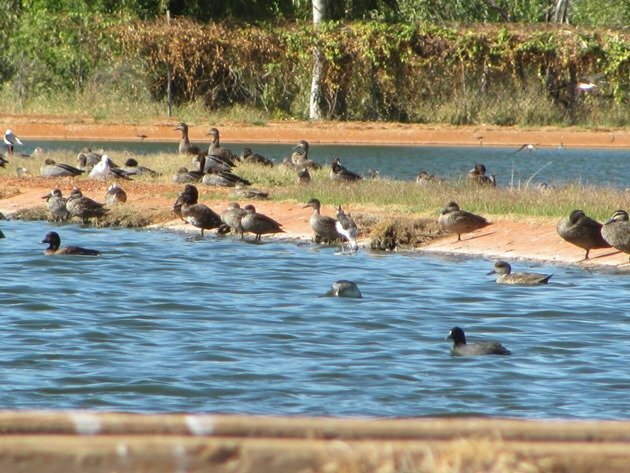 There were plenty of ducks to observe including Pacific Black Ducks, Grey Teal, Pink-eared Ducks, Australian Wood Duck and Hardheads. Eurasian Coot, Hoary-headed Grebes and Australasian Grebes bobbed around in the water and Plumed Whistling Ducks, Black-fronted Dotterels, Red-kneed Dotterels and Red-necked Avocet stood on the banks. Lone Black Swan, Pink-eared Ducks and so much more! The huge numbers of both Tree Martins and Fairy Martins flying over the water at the Poo Ponds was problematic from a photographers point of view, because they were apparent in so many of the photos that I took! 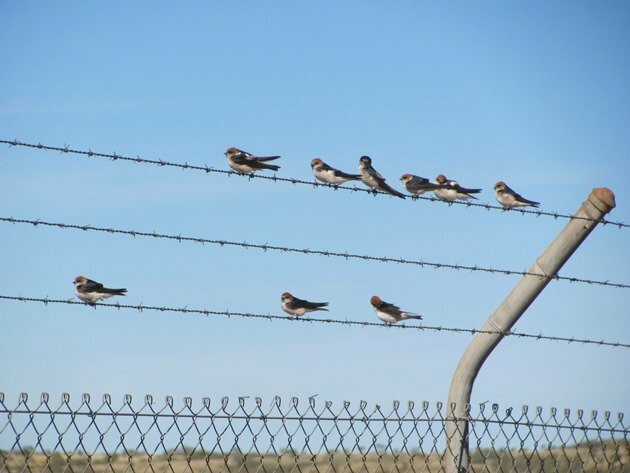 Occasionally the Martins would rest on the fence and so that did offer an opportunity to photograph them intentionally rather than a blur across all other photos! The highlight of our visit to the Poo Ponds was the addition of Orange Chats to our year list and a beautiful male specimen stood on the bank just inside the fence momentarily. 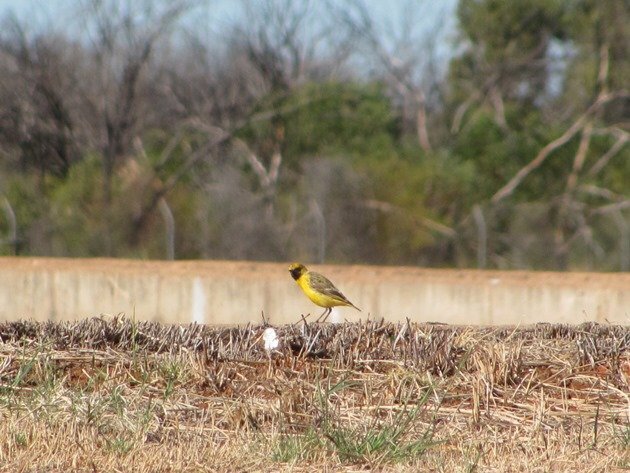 Yellow Chats are a common species around the Broome area and you do have to travel a long way to encounter both Crimson Chats and Orange Chats, but it is worth it! Admittedly Orange Chats are not as orange as you may think! An interesting feature of the Poo Ponds is the very old sign telling you not to shoot the ducks, which has obviously seen better days and of course it has been shot at! 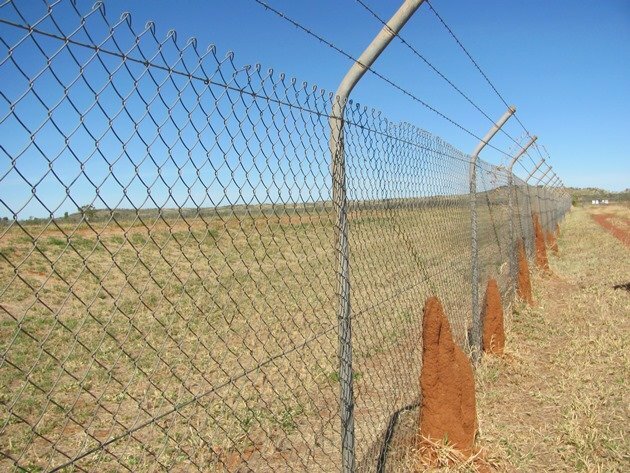 The termites are actively using the perimeter fence to their advantage and we were rather disappointed they had not put more effort into making a more substantial platform for us to stand on for better views! The surrounding bush was excellent for other bird species including Weebills, Red-backed Kingfisher, Zebra Finch, Mistletoebird and Rufous Songlark and a Black-breasted Buzzard was observed flying south of the ponds. 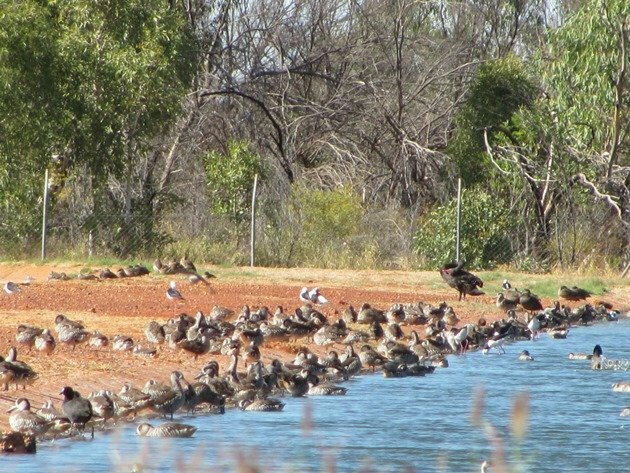 If you are travelling the Stuart Highway between Alice Springs and Darwin you will have to pass through Tennant Creek and we would highly recommend a visit to the Poo Ponds. They do not smell and the birding is excellent! Quite extraordinary, Clare! Around here all we see at “poo ponds” are Mallards, American Wigeons, and maybe Canada Geese! I love the termite mounds along the fence, too. WOW! what a great variety of birds. Mexico, at least here in La Paz, does “Poo Ponds” pretty well also. The new migrants are dropping in here like crazy…one of the hot spots is the adjacent grazing fields, where the “Clean” water is siphoned off and used to flood the fields…birding nirvana! as long as it is not too hot out, then the smell gets a little out of hand. They must do something different in Australia, because they rarely smell whatever the temperature!